Interests outside of work: Photography, though he claims he gets lesser and lesser time to practice it. For bringing efficiency and predictability to the unorganised and unreliable bus travel sector. RedBus has now made it easier for new bus operators to start even without an office for support. It is 7.45 pm on a Friday evening in Bangalore. Advertising professional Aditi is wrapping up for the day at the office when she gets a phone call. A friend has just been promoted and there is a party she has to attend. The location: Chennai. Aditi isn’t ruffled. By 9.45 pm, she has her duffel bag packed and is consulting a bus booking app on her smartphone. Based on her travel history, the app asks if she is interested in a weekend trip to Chennai. She replies in the affirmative and is shown a live ticker of luxury buses departing within a 5 km radius from where she is, all in the next hour. She identifies a favourite operator and is directed to its current position on a map. Fortuitously, it has seven unoccupied seats and will be crossing a traffic signal just a few hundred metres from her house. Fifteen minutes later, Aditi is in a seat automatically assigned to her by the app, based on her previous preferences. The ticket has been charged to her account. Early next morning, she is in Chennai. As she leaves the bus, the app on her phone gently buzzes and asks if she would like to return to Bangalore the next evening, with the same operator and seat. This scenario may sound somewhat futuristic to some but, for Phanindra Sama, 32, co-founder and CEO of redBus, the future is already here. Sure, less than 5 percent of the Rs 15,000-crore market for domestic bus travel has taken to the internet, but those that have, says Sama, are pushing the boundaries. And as an acknowledgment of the potential of the industry, the Ibibo Group, a joint venture between South Africa’s Naspers and China’s Tencent, acquired redBus at a reported valuation of $140 million (Sama refused to comment on the size of the transaction) in June this year. “We decided to sell because many factors came together,” says Sama. “I and Charan [Padmaraju, BITS classmate and redBus co-founder] had devoted most of our working lives to redBus, and there came a point when we realised that our parents weren’t getting any younger and our families were missing us. When we got a really good offer from Ibibo—and remember, an exit was always a question of ‘when’ not ‘if’ due to our prior venture capital investments—we decided to take it.” He adds that Naspers, one of Ibibo’s parent investors, is a great long-term backer. “Most importantly, they are running redBus as an independent company instead of merging it with another,” says Sama. Nonetheless, a $100-million-plus exit is significant for the Indian startup space. It is also a validation of redBus’s competitive advantage that it is getting it in a sector long considered low-value. Instead of depending on hunches or expensive trial-and-error, several operators use aggregated customer search data from redBus to identify newer routes. “Operators who were earlier busy managing broken-down buses, garages, drivers and grease, are now relying on technology,” says Sama. Over the next few years, technology will become even more central to the bus travel sector, he adds. “Customers will be able to hop on to a bus on frequent routes, without having to book in advance. Operators can use precise GPS data to modify driving patterns, thereby increasing both safety as well as fuel efficiency. This, in turn, will incentivise good drivers,” he points out. Since it started in 2006, redBus has become a catalyst for change in the bus travel industry. It helps that it was conceived following Sama’s own experience. In 2005, Sama, then a senior designer with Texas Instruments in Bangalore, was unable to get bus tickets to Hyderabad to be with his family during a long Diwali weekend. Frustrated (having drawn blanks with multiple agents), he wanted to create a system that introduced predictability and efficiency to an unorganised sector. 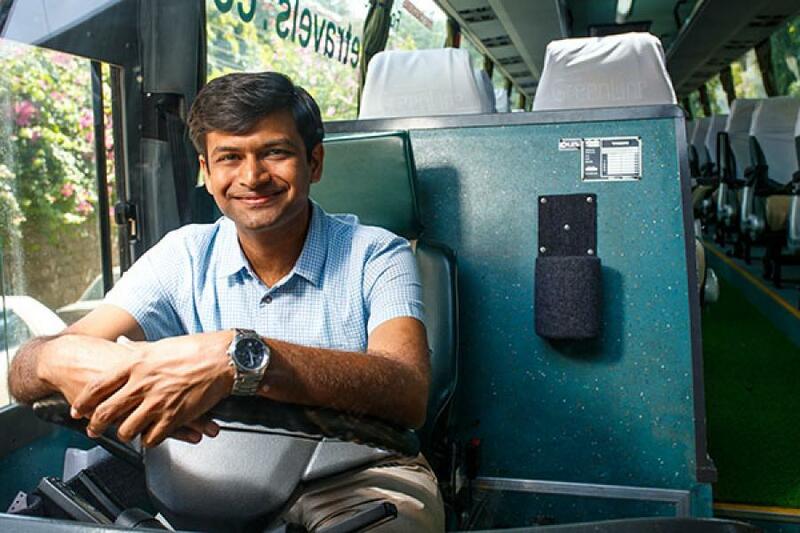 Two of his engineering classmates from BITS Pilani, Charan Padmaraju and Sudhakar Pasupunuri, joined him as co-founders and redBus was set up. The business was incubated with the assistance of TiE Bangalore and, in 2007, it received Rs 2.5 crore of funding from Seedfund. Despite that, redBus had to fight an uphill battle in its early days to convince notoriously suspicious and hard-nosed bus operators and ticketing agents about the upside of using technology; that it could dramatically increase the size of the market. As computerisation became the norm, customer service too started to matter more. Prodded by the fear of bad reviews on the redBus website, operators started monitoring and investing in customer service. “There are operators today, like Orange Tours, which went from zero to 70 buses in just two years solely on the basis of consistent four-star-plus ratings on redBus. Today, it boasts the highest fares and occupancy,” says Sama. Route planning and expansion has also become more predictable and numbers-driven. Earlier, bus operators stuck primarily to their home states, unable or unwilling to expand to newer regions. Even when they did, local agents stymied the entry of operators because of behind-the-scenes power games involving locals. “VRL, for instance, thanks to the internet, has expanded beyond Karnataka to many other states. Today new operators can start bus routes in a different city or state without the need for a local office or agent. Which is why we are seeing the emergence of routes like Hyderabad-Bhubaneshwar, Hyderabad-Ahmedabad and Bangalore-Udaipur,” says Sama. Significantly, redBus has created transparency and trust for customers who were previously wary of bus travel, and this has led to the expansion of the market. 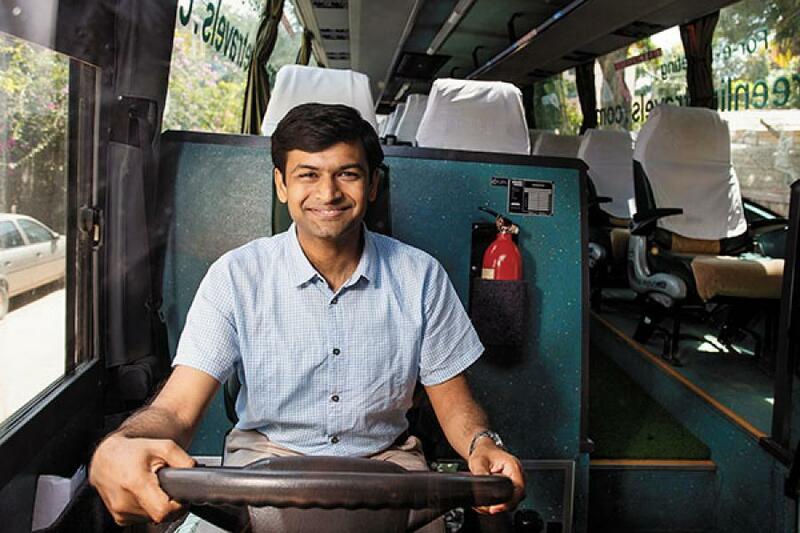 Though Sama has sold redBus to Ibibo, he is contracted to remain on board as CEO for a minimum of two years. And there’s no reason for him to not continue after that as well, he points out. Ashish Kashyap, CEO, Ibibo Group, also talks about Sama’s policy of empowerment. “Most entrepreneurs I have met are wary of giving up control but Phani is exactly the opposite. He has gone and empowered people across levels, which means the company is now about more than the entrepreneurs who founded it. It is an institution and platform for the entire industry,” says Kashyap. But even as he delegates, Sama continues to balance the big picture and the finer points, says Padmaraju, redBus’s chief technology officer. For instance, while discussing the strategic relevance of investing more money in their own call centres (which account for nearly half of redBus’s employee strength), “Phani would constantly question the strategic rationale behind additional investments, asking if that would serve the company well in the long run,” says Padmaraju. “This is even though we had venture funding and could afford to invest.” Then, at the other end of the spectrum, he adds, Sama would want to discuss the type of telephony equipment that the staff was using. The attention to detail was noticeable when Forbes India visited Sama at the redBus office. As he walked into a conference room, he got into a friendly banter with another employee who was exiting the room but had forgotten to switch off the air conditioner: From their early days, Sama has ensured that redBus keeps its own costs down to stay profitable in a low-margin sector. The biggest challenge, or opportunity, that redBus faces is the rapid rise in mobile consumers. “As the number of web users reduces and mobile users increases, we will have to unlearn many old lessons. For instance, the typical mobile user books tickets during the evenings and the weekends from the leisure of his home compared to a web user who usually makes reservations on a weekday and from the office,” he says. “Do you remember Akbar Travels, which used to be the biggest travel agent [for airline tickets] prior to the entry of MakeMyTrip? They used to do around Rs 2,500-3,000 crore in ticket sales every year. Today MakeMyTrip boasts those numbers. It’s not that Akbar Travels didn’t have a website, they do, but the user experience was so bad. That can happen to us too as we transition to mobile. It is an opportunity for somebody to try and disrupt us,” Sama says. The biggest advantage redBus, a Rs 600-crore (in gross ticket sales) company, enjoys over peers such as Travelyaari, Abhibus and Ticketgoose is its focus on selling tickets directly to consumers. “As against our competitors who derive 80 percent of their revenue from B2B [selling to agents and operators] and only 20 percent from consumers directly, our ratio is the opposite—80 percent of our revenue comes from consumers,” says Sama. As a result, redBus could afford to give only 5 percent as commission to agents, compared to the 8-9 percent paid by its peers. “Some of our competitors focussed on business customers while we focussed on the consumer side; that meant they had to pass on most of their commissions to agents. Today, they are struggling to raise money because doing that requires scale, which their low margins don’t allow,” says Sama. Dear sir, my name is Kunal singh living in patna Bihar.here I m plying 20 buses in a very reputed girls school since last 13 yrs.i am glad to say that all of you have done a great job in an organised way in this sector in which a very few people are literate.do you have any plan for patna delhi bus route?i would like to work with your organigation,if possible please answer.regards kunal singh.